The displacement of adivasi communities and the industrial takeover of their ancestral land is a tragic story affecting many Indian regions. Even in tribal territories that are not experiencing insurgency, like in the more peaceful forested regions on the Madhya Pradesh-Chhattisgarh border, tribal communities continue to be affected by displacement and poverty. The environmental dimension only makes matters more complicated since the best practice seems to be to firewall nature off, from habitats and human activity altogether. Thinkers such as Gunter Pauli and Idriss Aberkane argue that economy and ecology do not need to be seen in opposition. The problem, according to them, is that we have been mining the wrong thing. Nature holds something far more precious than wood, coal and minerals — something which industrial practices have been destroying in their crude quest for cheap bucks. This ‘something’ is the ecosystem itself and the infinite wealth it represents. Not only do forests produce goods that constantly regenerate themselves as long as the ecosystem is kept alive (this is what permaculture attempts to do), they also are vast libraries, which contain knowledge we have only begun to explore (biomimicry, which mimics nature for knowledge is a booming scientific field). 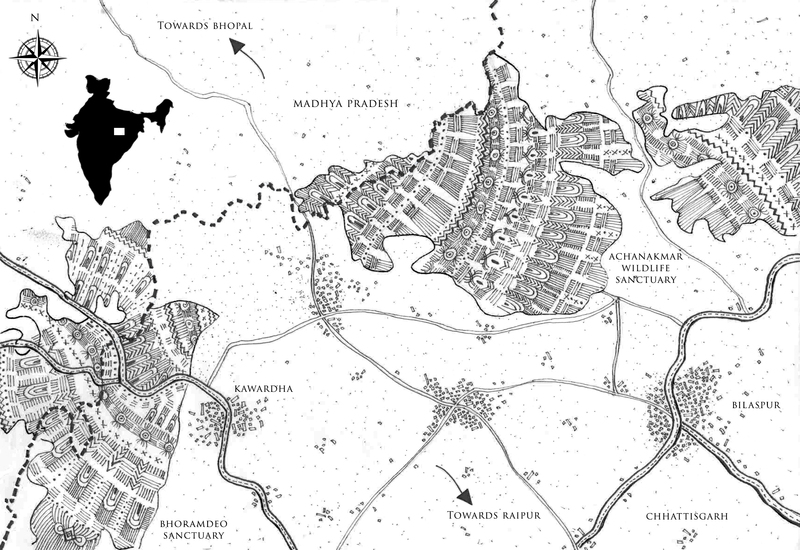 The Baiga and Gond tribes, which are present in the area depicted on the map, just like other nomadic and semi-nomadic communities, traditionally relied on knowledge of the forest for their livelihood. They had advanced cultivation techniques, which used the forest produce while allowing it to regenerate. They sourced locally woven fabrics and traded with other communities. Their art produced a distinctive style, which was central to marking their identity and territory. The Gonds even had a kingdom, some of whose proud descendents live in an elegant palace in Kawardha. Tribals in India have often been misrepresented either as simpletons in need of saviours or as savages who needed saving from themselves. Historically however, many politically sophisticated tribal communities, like the Gonds, fought tooth and nail against upper caste kingdoms. During the colonial period, the very basis of adivasi independence — the forest — was taken away from them. The colonial hunger for natural resources was insatiable and it is then that displacement started on a larger scale. Today, governments, social workers and activists often act as mediators between adivasi communities and the rest of society with mixed results. Among the Baigas in Chhattisgarh, there have been some recent attempts at redressal of land alienation. However, local bureaucracies often make each step towards access to the forest one more paper hurdle to cross. This is making it easier for corporate greed, political manipulation as well as insurgent groups to prey upon tribal frustration. India’s adivasi societies, polities and economies involved as much sophistication as any other. They followed a far more nuanced understanding of nature than industrial society, which seems to be stuck in a binary relationship, characterised by either pure exploitation or pure preservation. We seem to be far from the realisation that the best way of keeping forests going is by using them. This can be done by letting tribal communities take charge of the forests once more. Such a move, combined by modern education and appropriate technology can integrate traditional knowledge into the economy. In the long run, this may help sustain forests and its resources while generating livelihoods for their inhabitants. Given an increasing global interest in promoting ecological goods, this is not so utopian. From Mahua to honey, from local weaving traditions to medicinal plants, the possibilities are endless. What this needs is a more imaginative response from the rest of the country. One that facilitates active connections between its urban habitats and its rich forested eco-systems.